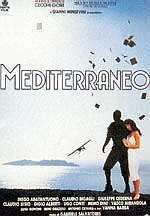 Mediterraneo is a 1991 Italian film that won the Academy Award for Best Foreign Language Film in 1991. The film is set during World War II, and regards a group of Italian soldiers who become stranded on a Greek island and are left behind by the war. The filming took place on the Greek island of Kastellórizo, in the Dodecanese island complex. In 1941, one year after Italy joined Germany against the Allies in World War II, a small group of misfit Italian soldiers is sent to a small Greek island in the Aegean Sea for four months of lookout duty. The soldiers include a lieutenant who likes art, a macho sergeant, a farmer accompanied by his beloved donkey Silvana, and other quirky people. They are not very good soldiers, but a cross section of average, independent men. The soldiers anticipate attack from outside and on the island and take all sorts of inept precautions. They find a small town with no people. That night, they see bombing on the horizon and realize that the ship that would pick them up has been destroyed. Then mysteriously, people reappear in the village: the villagers say they hid because the Germans had taken all the men, but having seen that the Italians are absolutely harmless they have decided to return to their lives. It isn't long before everyone's sunny nature appears. The Italian soldiers, unacquainted to a war they clearly don't sense as theirs, are absorbed into the life, heat and landscape of the idyllic island. The local orthodox priest asks the lieutenant, a Sunday painter, to restore the murals in his church. Two soldiers, who are brothers, befriend a lovely young woman, a shepherdess. Sergeant Lo Russo, the only member of the crew with a fierly spirit for war, takes up folk dancing, and the shyest of the soldiers, Farina, falls profoundly in love with the island's single, very overworked prostitute, named Vassilissa. In their old age three of the men are reunited on the island to close the film. ↑ "Weekend Box Office : 'White Men' Outjumps 'Basic Instinct'". The Los Angeles Times. Retrieved 2011-06-06.